The Chartist movement existed in an uneasy relationship with the campaign against the corn laws. Introduced in 1804 and intended to protect landowners by imposing a duty on imported grain, the corn laws had the effect of keeping the price of bread at artificially high levels. Manufacturers who objected to having to pay high wages so that their employees could eat, and workers themselves, were resentful of this subsidy to farmers. Membership certificate for the Anti Corn Law League. Trade depression in the late 1830s and a run of bad harvests brought this resentment to the boil and in March 1839 the Manchester businessman Richard Cobden took the lead in uniting separate anti corn law associations in London and Lancashire into a single Anti Corn Law League. Under the influence of Cobden’s leadership and John Bright’s oratory, thousands flocked to the cause – among them many middle class radicals and industrialists. Many Chartists did support the Anti Corn Law League. Some middle-class backers of Chartism – notably the serial supporter of good causes Joseph Sturge – kept a foot in both camps. The movement also drew support from factory workers in Manchester, Huddersfield and, most notably Sheffield, where Ebenezer Elliott, known as the Corn Law Rhymer for his anti-corn law poems, was prominent early on in both causes. In their book The People’s Bread: a history of the Anti Corn Law League , Paul A Pickering and Alex Tyrrell mention many others. In Bath, the Chartist lecturer Henry Vincent organised a union between corn-law repealers and Chartists. In Preston and at Newchurch, Chartists supported the Anti Corn Law League case. And when Exeter Chartist Association collapsed, its secretary offered to help the League instead. At Tiverton, the secretary of the local Chartists told a debater sent by the Anti Corn Law League that his members were willing to break up the meeting if called on to do so. The Anti Corn Law League put considerable effort into winning and keeping the support of Chartist sympathisers, arguing that it was “a great error” to think that by campaigning for a repeal of the corn laws they needed to relax their efforts to win the vote, and indeed that, without repeal of the corn laws, an extension of the right to vote would be impossible. But working class radicals who remembered middle-class entreaties to support the 1832 Reform Act, only to be left outside the political system and without the vote once those same middle class reformers had won the franchise for themselves were naturally suspicious. Their suspicions would only have been confirmed by the Anti Corn Law League’s management of one its most successful initiatives, a conference of 644 members of the clergy called to pass resolutions condemning the corn laws on moral and religious grounds. Though the “convocation” consisted almost entirely of independents and clergy from relatively minor dissenting sects, Arthur O’Neill and other preachers of the Christian Chartist Church along with three “Rational Religionists” were excluded from the event. And William Hill, editor of the Chartist Northern Star , who attended as a Swedenborgian minister, was denied permission to speak on the causes of social hardship. As with all other causes considered to be a distraction from the Charter, the campaign against the corn laws was also vigorously denounced by Feargus O’Connor, who was quick to point out that the League was essentially an employers’ organisation. In fact, when the general strike of 1842 broke out while delegates to a National Charter Association conference were gathering in Manchester, O’Connor’s first reaction was to distance himself and Chartism from the strike because of its links to anti corn law agitation. 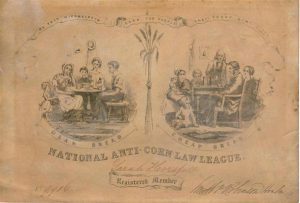 The Anti Corn Law League succeeded in its campaign in 1846. It did so in part because the circumstances of the potato famine in Ireland swayed prime minister Robert Peel to the view that the taxes on corn could not be sustained, in part because it achieved what Chartism managed only later and less successfully in winning the election of Cobbett and a number of other supporters to Parliament, and in large part because the now powerful industrialists were no longer prepared to subsidise the vestiges of a feudal economy. The Anti Corn Law League was also better funded, better equipped, more highly centralised and much more professional than the National Charter Association could ever hope to be. Alexander Somerville, a journalist secretly in the pay of Cobden, described a visit to Newall’s Buildings, the Manchester head office of the league, in 1843. This account is taken from his book The Whistler at the Plough , first published in 1852 and reprinted by The Merlin Press in 1989. “Accordingly at ten o’clock I was in Market Street , a principal thoroughfare in Manchester . A wide open stairway, with shops on each side of its entrance, rises from the level of the pavement, and lands on the first floor of a very extensive house called ‘Newall’s Buildings’. The house consists of four floors, all of which are occupied by the League, save the basement. We must, therefore, ascend the stair, which is wide enough to admit four or five persons walking abreast. Some idea of the wealth of the Anti Corn Law League can also be seen in the annual accounts, which can still be seen in the Cobden Collection at West Sussex Records Office . At the beginning of the 15-month period from 9 September 1843, the Anti Corn Law League had cash in hand of £2,476, 10s, 3d. By 31 December 1844, it had raised £82,735, 3s, 5d from subscriptions and a further £797, 13s, 7d in bank interest. In the following year subscriptions alone brought in a further £35,678, 8s, 10d, and from January to October 1846 when the organisation was wound up they generated a further £41,897 12s 7d. A second document in the Cobden Collection provides a breakdown of the largest donations – though, unfortunately, without naming the donors. It includes 889 subscriptions of £10 or more each, of which 10 (all from Lancashire) were of £1,000 each, while 20 more (11 from Lancashire, 5 from Yorkshire, 2 from London and 2 from elsewhere) were each of £500. By contrast, though the Chartist National Land Company initiative raised more than £100,000 to buy smallholdings, it took 70,000 small donations to raise this sum, and when Ernest Jones effectively took personal control of the National Charter Association in 1851, the remaining members of the executive struggled for six months to pay off the organisation’s debts of less than £40. £2,645, 16s, 10d on deputation expenses, “including travelling expenses to attend meetings & Parliamentary Ekections in various parts of the United Kingdom ”. £1,498, 15s, 0d on postage stamps, carriage and postage. Although Somerville ‘s report suggests that the League employed considerably more people, the accounts name 13 employees and record their salaries and expenses for the period (see box below). The Anti Corn Law League appears to have been able to pay good salaries. Figures compiled in 1838 for Leeds by the Statistical Society and quoted by Eric Hobsbawm in Labouring Men (Weidenfeld and Nicolson, 1968) show weekly wages for millwrights of 26 shillings, gunsmiths 25 shillings, shoemakers 14 shillings and weavers 13 shillings. Even then, shoemakers and weavers could expect on average to work just 10 months of the year, cutting their annual incomes still further. a . James was engaged for six months from 1 May to 31 October 1844; in addition to the expenses shown the accounts record "Middlesex Registration Society £485, 18s, 6d. b. "T Plint in this year  made a deduction for time employed in his own affairs, and also for £10 paid him by the Leeds Committee." c. Jones' salary was for eight months of 1844, from 1 May onwards. d. Lyons' salary was from mid April 1844 to the end of the year. e. Huggett's salary was for eigh months of 1844, from 1 May onwards. f. Bontems' salary was from 25 March to 31 December 1845.
g. Huggett's salary was for 5.5 months of 1845.
h. Harwood's salary was for 2 months of 1845. John Murray, Timothy Falvey, John Finnigan and Sidney Smith were employed as league lecturers. One of the largest and most imaginative combined fundraising and publicity events organised by the Anti Corn Law League was a “free trade bazaar”, which it held over three weeks in May 1845. 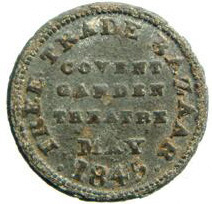 The League booked the Covent Garden Theatre, and invited its supporters to take stands displaying and offering for sale handicrafts and products in support of the cause. From reports provided by the League itself, the response appears to have been enthusiastic, with items ranging from Scottish tartan cloths to Staffordshire pottery on sale and crowds flocking to see what looks to have been a modest precursor to the Great Exhibition of 1851. During the event, the League published a series of 15 daily copies of the Bazaar Gazette , providing visitors with a souvenir and information on the products on show, leavened with a mix of free trade politics. This extract from the final issue gives a flavour of the event’s popularity. Note: M+ indicates that the council member's wife was involved in the women's committees formed in 1841 and 1845. This table was compiled by Pickering and Tyrrell from extensive sources, and a fuller version offering details of the organisations in which ACLA members were involved appears in their book The People's Bread: a history of the Anti Corn Law League. The two questions are distinct. Each is enough for separate exertions. is demanded, because those who are taxed should have a voice in electing Members to the House of Commons. And because the working man has interests of as great importance in good governmetn as any other man whatever. is demanded: Because dear bread is an evil – cheap bread a good. Because they shut out food when most needed. Because they injure trade and commerce, throw out and keep out of work many thousands of industrious people. Because, when many thousands are unemployed, or only half employed, and doomed to starvation, they undersell one another, and wages fall;-thus perpetual injury is done to the whole body of working people, men, women, and children. Because, by refusing to take corn from foreign nations, we disable them from taking our manufactures, and thus to an amazing extent prevent the increase of employment, which alone can cause good wages to be obtained. SIGN THE PETITIONS FOR REPEAL OF THE CORN LAWS. The Repeal of these Laws, which, if not Repealed, will, at no distant time, starve to death vast numbers of our industrious people. The Repeal of these Laws, which, when they have produced the result, shall make the obtainment of the suffrage impossible – since a beggarly people never did and never will compel the government to grant any Reform whatever. Persons favourable to the Repeal of the Corn Laws are requested to enrol themselves Members of the Association. PETITIONS READY PREPARED, may be had on application at the Rooms of the Metropolitan Anti Corn Law Association, No. 154, Strand . —————- Printed by T. Brettell, Rupert Street, Haymarket.